The last two weekends have been great for kitefishing on the west coast. Easter weekend produced some good results but last weekend, especially on Sunday, the fishing was hot. A big swell was running on Saturday, but most kitefishers got in a few good sets despite the strong rip. I was doing a product photo shoot so didn't have enough time to wet a line or check out peoples catches. On the way out from Rimmer Road at midday we were checked by Niwa who are doing research on recreational catches and they told us few snapper had been caught so far. This may have been because most people were still fishing at the time. By Sunday the wind was howling, the surf less than a meter and a half and the snapper were in close. I was fishing 13 kilometers north of Rimmer Road with Scott Macindoe and Bill Ross from option4. On the way back we stopped and chatted to several kitefishers and all had caught fish. The chap in the red tee shirt above had the best catch we saw. 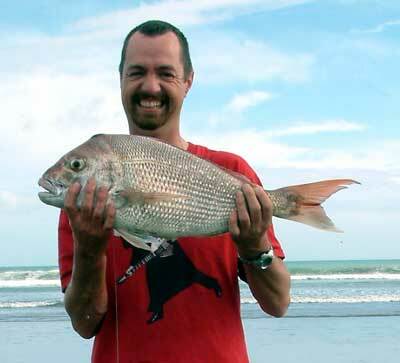 He was kite fishing around three kilometers north of Rimmers Road and had a large bin with six or seven snapper over a kilogram, plenty of gurnard and several kahawai. The fish in the pic above was their biggest but they were doing one more set. We met James Rutter and his dad, Chris about 10 kilometers north of Rimmer Rd. They had just hauled in their first set of their kite rig and had caught three small snapper and a kahawai when we arrived so I took a pic of James (left) as they were getting ready to reset. On arriving home I received an e-mail and the two photos (below and bottom) from James letting me know they caught eight snapper, one kahawai and a gurnard for the day. If you have been getting our newsletters for a while, you will know Sam usually kite fishes with Rob from Paul's Fishing Kites and sends in catch photos by cellphone. On Sunday we bumped into Sam fishing about six kilometers north of Rimmers Rd and managed to get a full sized photo of him. The snapper in the pic below was his biggest and he still had a set to haul in when we left. It was a strange wind on the Sunday, ground wind was 10-15 knots with 25 knots plus above 100 meters altitude. Around 10.30am a series of squalls went through. Ever since I have had a winch, I have been using a 1500 meter 65kg Dropper Rig powered by a Power Chute Kite (pic right). For three years this kite has performed flawlessly, but on Sunday a huge gust of 35 - 40 knots got the better of it and it crashed after flying perfectly in 25 knots for an hour or so. We still caught the biggest snapper of the day on that set plus a gurnard, shark and a couple of kahawai. Complacency had got the better of me over years of trouble free flying (this kite had never even been near the water). Because of this I did not have the recommended safety trace, recovery line or kite floats on it. Thank god I had the winch! It took huge effort to recover the kite and I had to pull it 20 meters at a time on the pulse switch to avoid snapping the mainline. Further down the coast one of our customers reported he was using the a bigger version called a Mega Mouth (photo below) and he had the same thing happen. He was also flying his kite without safety trace or floats. 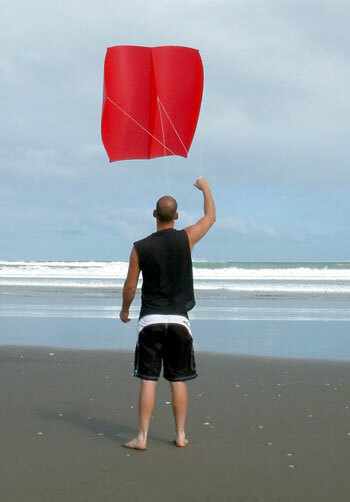 He lost the huge kite because of it, despite the fact he was flying it on a 200 pound breaking strain spectra kiteline. The lesson is clear, safety traces and floats really work, not only do they protect kites from loss they make it very easy to recover downed kites. The pic above shows the 130lb dacron recovery line slack, one end is attached to the center keel and the other to the 65kg kiteline. The three leg bridle the kite is flown from is attached to the kiteline via a 24kg trace. 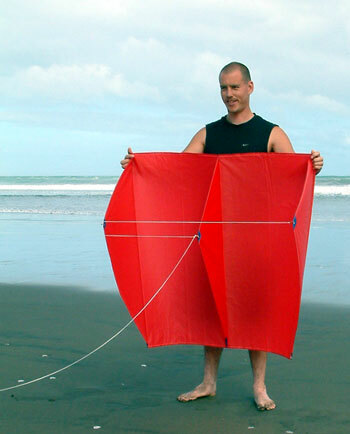 If the pull from the kite exceeds the 24kg the safety trace snaps, and the kite is easily hauled back by the center keel on the recovery line. Our Power Sled range of kites are great light wind performers and fly in up to 25 - 30 knots of wind but on this day the wind was just too strong. We put a Super Kite (a small delta kite) on the dropper rig for our next two sets and it flew perfectly for the rest of the day. We wound up with three snapper up to 1.5kg, two gurnard, eight kahawai and a small school shark. 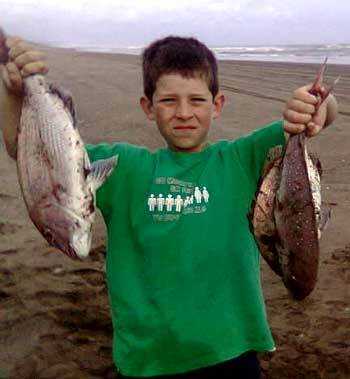 Kingfish up to 25kg are in thick schools and big trevally are currently being caught at Destruction Gully in the Manukau Harbour. The kingis are readily taking fresh kahawai strip baits while mussels, shellfish and pilchard baits are getting the trevs. 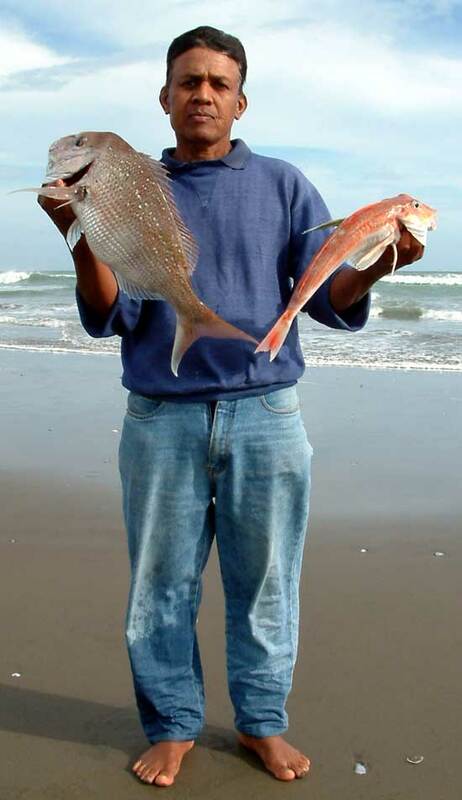 Evening fishing with kites and kontikis has been producing big hauls of 1 - 3kg snapper for the last six weeks. We got to the beach and the wind was blowing a gale, it was howling in our ears so had to be 30 knots plus. 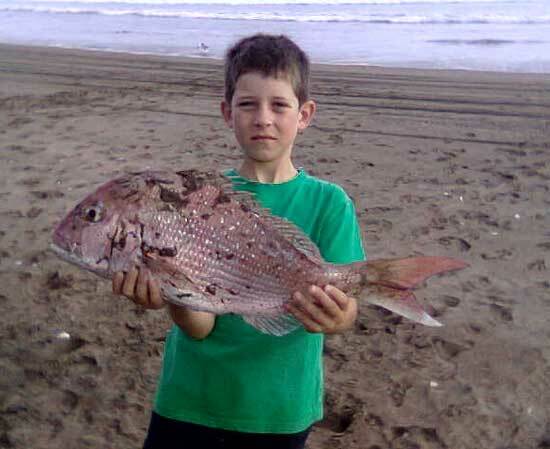 We set our kontiki bag but the current took it along beach, when we pulled it in we had caught one legal snapper. 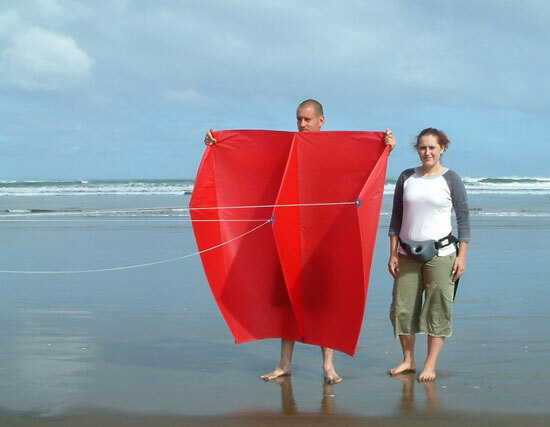 We decided to try the kite, it went up but crashed in when a gust broke the wooden cross spar. We had a spare but broke it the same way. We then went into the dunes and cut a spar as thick as my thumb from tea tree! The kite went up with the kiteline connected to the light wind setting, it pulled like a train! The first set of 20 hooks were baited with mullet and was put out on the incoming tide. We only let out 500 meters and pulled it in after 15 minutes. We only got one snapper on the last hook, but it was a good fish of 3.5kg!. We set the line again, this time 750 meters out for half an hour, and pulled in eight more snapper with the best five being around 2.5kg each. It was just about dark so we did one more set the same as the last one but by now the tide was going out. It was another winner and we pulled in six snapper with the four biggest around the 2.5kg mark and the other two well legal. The kite sustained no damage from its ordeal but it certainly was very hard to pull in. We went home really happy. Now when we go out we always have a tea tree cross spar with us! On April 8th we headed up North to Urquharts Bay, the bay is near Whangarei Heads, and looking back onto the refinery. Despite our best efforts, the winds were just no good for the kites so we decided to throw out some surfcasting rods. There were six of us on the beach that day, only five of us were fishing though. The water was very warm and very clear, and fishing was extremely exciting. We tried out some pilchards on the first few casts but these didn't appear to be working so I moved on to a two hook rig and baited up with frozen squid. It was all on! Fishing 24kg line casting to a depth of about 150 feet, there were quite a few bust offs on my 40lb traces so I started using a wire leader, it worked a treat. As soon as the line hit bottom there was a strike. Fishing was red hot! The water was so clear you could see large schools of kingfish cruising through and loads of baby snapper. We managed to land a total of five kingfish up to 40kg and 10 john dory, most of the snapper were throw backs though. It was some of the most exciting fishing I've done for a long time. Will be sending through some photo's soon. Gidday, a couple of weeks ago I called and purchased a delta kite kit etc. I spent too much time with you and missed my flight! The Easter break saw me and a few mates down out our whitebaiting hut on the Paringa River in South Westland. The early morning off shore breeze seemed suitable for my first cast as a kite fisherman. The wind was light, very light so the sky hook was added and sent skyward. As it was my first cast into the unknown I set only three hooks and it slowly made its way out to about 300m offshore. After about 15 minutes, and several more scanning the waves for the flag and float which had disappeared, I panicked thinking that there must have been something big on pulling the float out of sight. WRONG. Nothing but empty, still baited hooks. Time to set it again. What a mess. With three eager helpers each pulling in different directions we ended up in a real tangle. The wind dropped completely so I packed it up . Next day bright and early with a better breeze a perfect set. My mates jumped in the boat and shot back up to the hut to start breakfast leaving me to watch the kite. They had no sooner left and the wind moved 45 degrees and dropped completely bringing both kites down into the sea . A quick call on the radio back to the hut brought reinforcements to help me with the long haul back in. This time some success. A small doggie. Still better than nothing. The next couple of mornings were wet with no wind. Not a great start to my kite fishing but lessons learnt. I am now planning a trip to an east coast beach around Christchurch to test the waters. Two more lots of easterlies are coming. The first should arrive tomorrow 27th April and could last a couple of days. Westerlies are predicted from the 29th to the 1st May before the wind swings back to the east. A special thanks to all those who took time to send in reports. If you would like to send in a report please use the form above.